Cities Connection Project | SOCIAL HOUSING. CAN CARALLEU, BARCELONA. The project is organized in two blocks supported by a base and joined by a wall that creates a unitary image and separates private from public space. A mechanism of slight setbacks is used to nuance the proximity of the buildings, extending the point of greatest tension. The volume is emptied out on the top floor, eliminating the north-facing dwelling, and on the ground floor, to create the entrance porches. The building houses 36 apartments of 40 m2 for young people, laid out around a central nucleus that houses the service spaces. 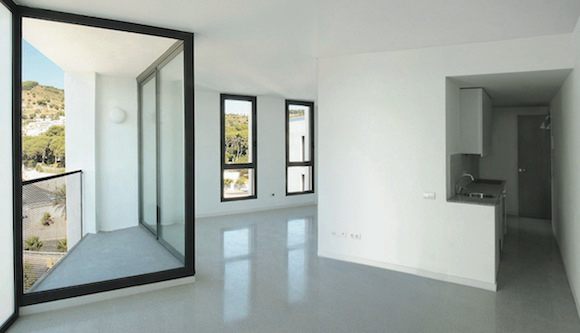 The bedroom and living room are designed as a flexible, continuous space. The displacement of the nucleus from the centre of gravity of the floor plan frees up space for the entrance, the utility area and the kitchen, while the free-standing bathroom generates a double circulation producing apparently unlimited space where the occupants never have to retrace their steps. The occupation of the nucleus activates the empty space around it: not so much left-over space as one that the inhabitants discover as they move around it, as it empties. 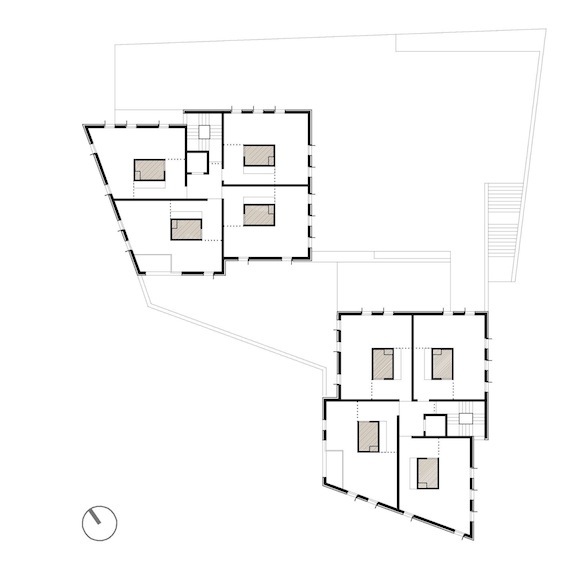 The undifferentiated use of the space is expressed by a single window type in the composition of the façade. To mitigate traffic noise there is an acoustic filter in the form of galleries, whose shadows give the façade greater depth. Shutters project from the windows to cast shadows that move according to the angle of the sun. Four large openings mark out the building’s structure as seen from a distance from the Ronda de Dalt beltway.